Ingleside Racetrack horse race with Merced Heights ridgeline in background, late 1890s., circa 1899 - Courtesy of a private collector. 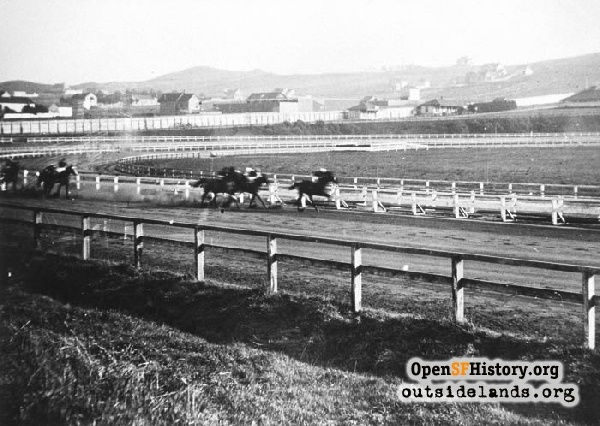 On November 28, 1895, the Pacific Coast Jockey Club opened the Ingleside Racetrack, just off the Ocean Road (now Ocean Avenue.) Mostly rural Ocean Road was considered "out of town" in those days and a horse racing track fit right in with the other gambling operations in the vicinity. There was a dog track, a shooting range, and a number of roadhouses along the dusty path. 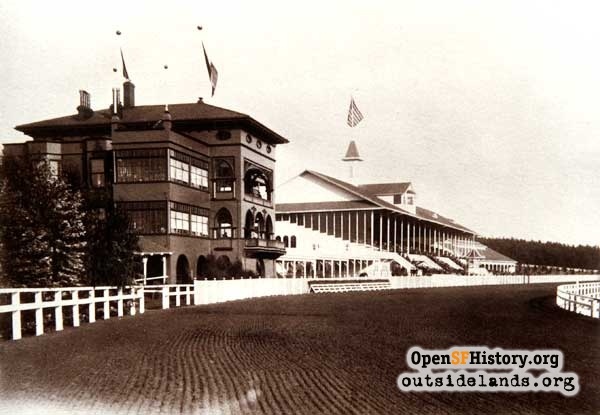 The Ingleside Racetrack elevated the elegance factor considerably, with a sumptuous clubhouse and a fine viewing stand. The horses had one of the best stables to be found in racing. On the once-sandy acreage, six inches of finely groomed loam was laid out for the track. Early auto races took place at the track at the turn of the twentieth century, and sometimes the winner happened to be the only vehicle to complete the course without breaking down or crashing. Auto speed king Barney Oldfield set records at Ingleside. Business declined, however. Thomas Williams' California Jockey Club took over the Ingleside track and promised a renewed schedule of races. But it wasn't to be. The last horse race was on December 30, 1905. 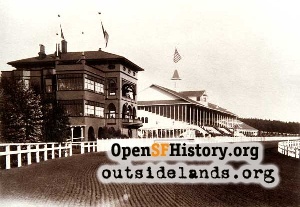 The track closed down and served as a refugee camp for many San Franciscans after the 1906 Earthquake and Fire. It also hosted patients from today's Laguna Honda Hospital as the facility recovered from the quake. In 1910, Joseph A. Leonard's Urban Realty Development Company bought the old track and set about turning the land into a residence park. By 1913 Ingleside Terraces had opened, with Urbano Drive laid out exactly on the loop of the old racetrack. 1. Benedict, "Turf Topics," The Wave,, March 12, 1898. Thanks to Marsha Fontes for most of this information! Read more in this Streetwise column, and in Angus Macfarlane's article. Page launched September 1999; Updated 30 December 2012.